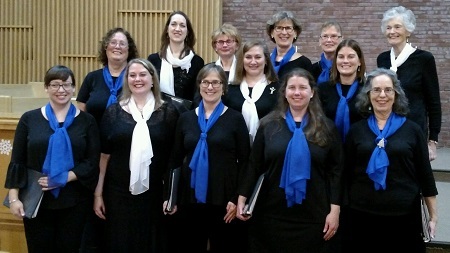 As one of the few women’s choruses in New England, The A Cappella Singers has delighted audiences in the Boston Metrowest area with diverse and enchanting programs since 1963. The ensemble has presented music varying from the 13th century to contemporary, from sacred to secular. Drawing a musically qualified membership from a wide geographic area, members are diverse in age, lifestyle, and profession. The common bond of all the singers is the love of vocal music. Our season runs from September to May, with rehearsals on Monday nights from 7:00–9:00 at the Fisk Memorial Church, 106 Walnut Street, Natick (map)—30 minutes west of Boston. We present two main concerts per year—a holiday concert in early December, and a spring concert in May, as well as other occasional performances at nursing homes, tree lightings, etc. The A Cappella Singers welcome new members during our semi-annual auditions in September and January. These are usually held during regular rehearsals the first three Mondays after Labor Day and New Year’s Day, respectively. We are actively seeking voices on all parts. Come join us! The A Cappella Singers is a member of the Greater Boston Choral Consortium (GBCC), a cooperative association of diverse choral groups in Boston and the surrounding areas. The GBCC consists of about 60 groups and meets monthly to discuss issues of concern to singing groups. Many thanks to the Natick Cultural Council for their generous grant.